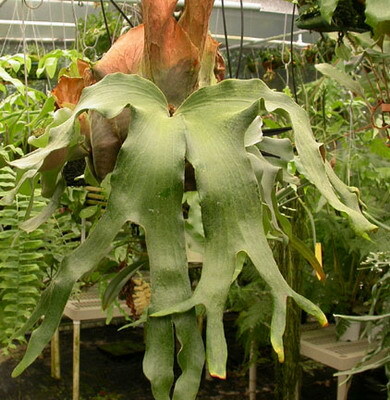 Charles Alfred, a prominent grower in Florida created this cross and named it after Don Callard, former president of the San Diego Fern Society. Don has done more for platyceriums than most people realize. This author feels the P. quadridichotomum trait is obvious in the fertile fronds with the wide frond and the forking. P. quadridichotomums get their name from the forking which results in 4 tips. Both the P. quadridichomum and P. andinum have spore patches between the first and second fork and not on the tips of the fertile fronds. The andinum is also apparent in the fertile fronds plus the tall narrow shield frond whereas the quadridichotomum shield fronds flare out more to form a basket shape. The P. stemaria 'Laurentii' also grow a similar fertile frond and spore patches. I am sure we will learn more about this hybrid as more studies are completed. The reader must realize that many hybrids are a result of accidental mixing of spore when similar plants are grown in close proximity. Even when spore from two species are intentionally crossed, it is always possible for a spore from an unintended species to contaminate the intended cross. A cross of two species is considered a sport, or cultivar until it's progeny duplicate the same traits through spore propagation and pup division. After many years of second and third generation progeny from the original plant can we call it a hybrid This can take a long time with slow growing platyceriums and experienced growers are hesitant to jump the gun and name a hybrid. So when we discuss hybrids, we need to consider all the variables. Soon we will have more definite DNA studies. Until DNA testing is more readily available, and established parent base lines defined, we must look at and compare traits from other species and deduct a logical inference to the actual parentage and these are considered individual plants and not necessarily a hybrid.